A rich, interactive experience to showcase the history of giving. To expand on their mission to provide philanthropic expertise to donors, foundations, and financial institutions, the National Philanthropic Trust (NPT) wanted to update a timeline they had created that detailed 500 years of philanthropic activity worldwide. In addition, they sought to turn an outdated microsite into a comprehensive consumer-facing resource that put philanthropic work in a broad historical context. The organization’s original History of Modern Philanthropy was dense, static, and difficult to engage with. The site provided little context for the various entries on the timeline and had no clear organizing principle or hierarchy. NPT asked Suka to reimagine their existing content into an interactive, immersive, and responsive digital experience. 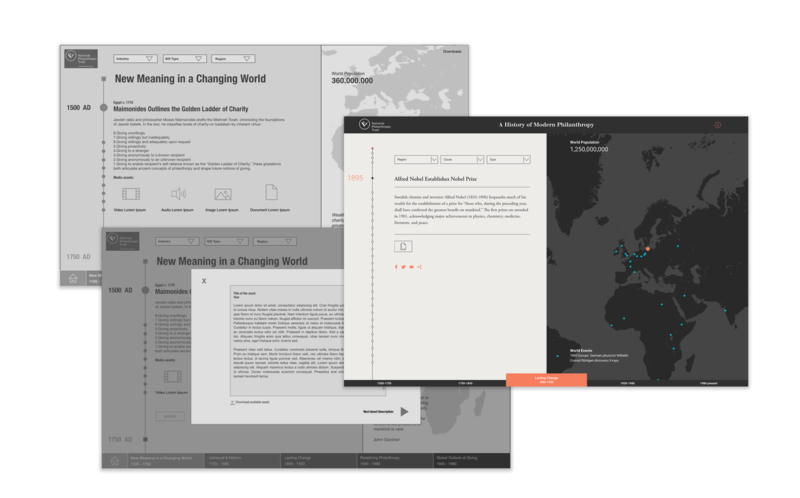 We completely rebuilt the timeline and added an accompanying map that visually demonstrated the spread of philanthropy across the globe. The goal was to inspire curiosity and interest in the history of philanthropy and communicate its global impact over the last 500 years. 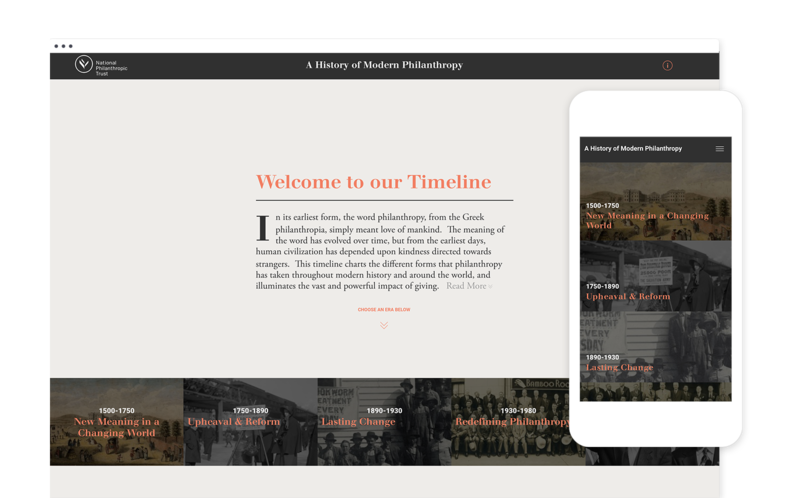 The timeline was sectioned into five distinct eras with filters that gave users the ability to select data points by region, cause, and type of philanthropic commitment. This design afforded users self-directed exploration and engagement with the site through a variety of entry points. The flexibility of the new site’s interface also enabled visitors to browse content at their own pace and dive as deeply as desired. 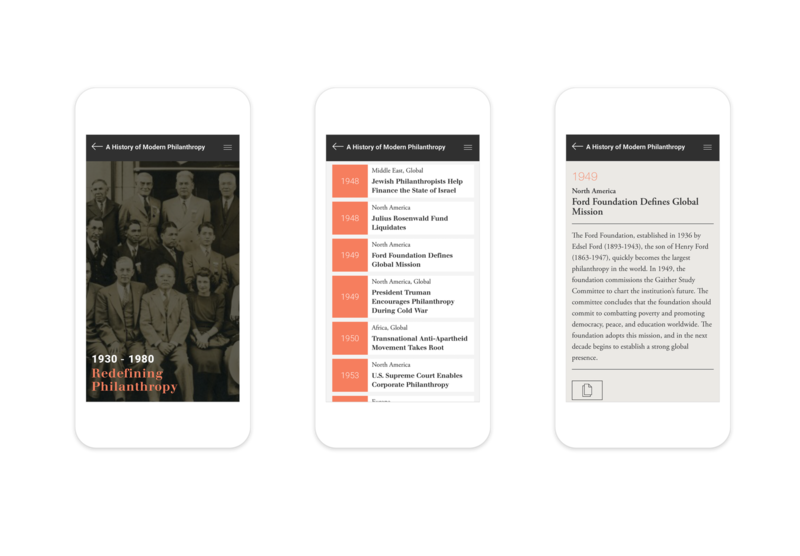 The new History of Modern Philanthropy site is a dynamic education resource bolstered by client-curated historical content and media assets dating from the 1500s. Since its release, it has become a key part of college curricula in the U.S. and Canada, with additional distribution by philanthropic organizations in Brazil and New Zealand. It was also awarded an Outstanding Website Award at the 2017 Web Awards.